Baskin-Robbins reveals new Caramel Cappuccino Cheesecake ice cream as the December 2018 Flavor of the Month. 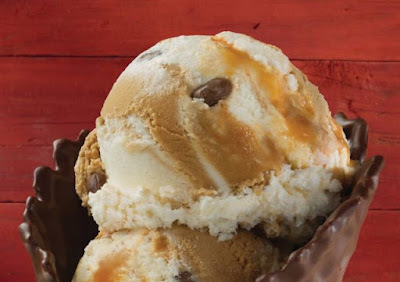 The new flavor features cheesecake and coffee ice creams with cappuccino toffee pieces, cheesecake pieces, and a salted caramel swirl. - Winter White Chocolate - white chocolate ice cream with cherry pieces in a chocolaty coating and a cherry ribbon. - Mint Chocolate Chip - Mint ice cream with chocolate pieces. For the holidays, there's the new Red Velvet Roll Cake, a cocoa-flavored red velvet cake with cream cheese ice cream, topped with red velvet cake crumbs and chocolate swirls. Finally, on Monday, December 31, 2018, you can get a regular or kid-sized scoops of ice cream for $1.50 at participating locations nationwide.